A rather miserable and grey Sunday afternoon prompted an extended session safely indoors, sitting at the painting table, yesterday. 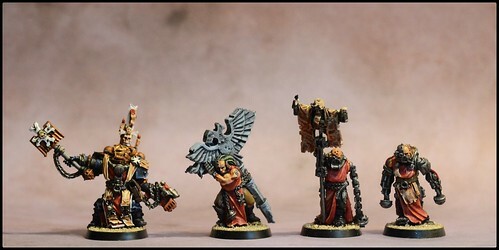 That in turn yielded this troupe of rather baroque looking miniatures from the Black Templar's Chapter. 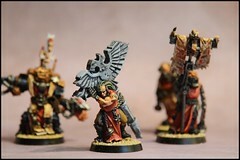 Chaplain Grimaldus and his retinue of cenobyte servitors made for an interesting project. 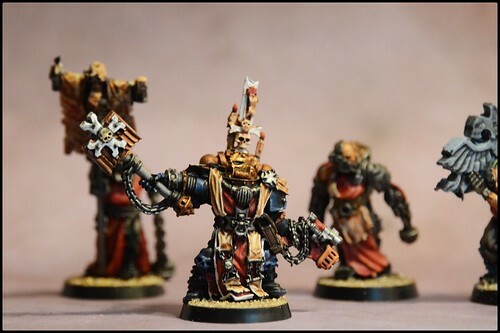 The models have a lot of cool little details to them, in particular the chaplain himself. 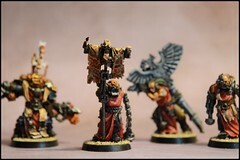 The servitors carry with them a series of ancient relics, rescued from an Imperial Temple as part of the great battles on Armageddon, one of the more famous campaigns in the Warhammer 40k mythos. These models were a ton of fun to paint. They come together as one pack, and made for a nice stand alone project ... perfect for a grey Sunday afternoon of painting. I'm also getting much happier with the camera settings and photography set-up that lets me get these pictures of them. It's not as easy as you might think to get good quality pictures of painted miniatures due to their scale, so I'm pleased I've finally found something that seems to work well!